Introducing the Strawberry Cake | I made that! This is my dream cake!! I dare say a pink girlie cake – love it! Aha! And I live in Alabama! Is there a place in particular that you would recommend for strawberry cake here? http://www.eggton.com (my Alabama cooking blog). What part of Bama are you in? Edgar’s Bakery in the Birmingham area (multiple locations) makes a great strawberry cake. Also recommended is the strawberry cake at Joe’s Italian in Alabaster. Hi, I am from Australia and just stymbled upon your blog. It is nothing short of wonderful. I am of the same persuasion to make everything (well almost) for my family. It might take more effort but it is far healthier and also more rewarding. Congratulations for your dedication. i think you are quite amaxing. I look forward to reading all your posts. I can’t find a recipe index. Will that be forthcoming or I just need to look again? I have been searching for a true strawberry cake! Made from scratch and not the icky you mention in your blog. There are women in my church (I’m in Georgia) who make the cake using the box mix and ready made frosting! People love it, but I think it tastes – well – artificial (because it is!!!). I will definitely be trying your recipe. I purchase stawberries in season and freeze them for use throughout the year. Thank you for posting this! I have been looking for a while for a strawberry cake that didn’t use jello. This sounds so good. Hey could you give an indication of how much time in the oven is needed for the three layers to be ready? Just an approximation to avoid screw-ups. I try to avoid times because they’re always so different! But I would start checking after 20 minutes. Mmmmm Strawberry cake, who knew! I’ve never had it before, perhaps because I’m from the North (of England!) but I certainly will the next time I can find an excuse. Yum! Yum. All the recipes I’ve seen definitely go the strawberry extract route. I like the sound of this pure version though to be honest, I might still add some red food coloring to bump up the color. This looks so cute and girly fancy! I love it! I’d love a big ol’ slice and I’ll see if I can find strawberries at our next local market. This is perfect, I just promised my 7 year niece that I’ll bake her birthday cake this year, and she asked for strawberry. Her birthday is in December; can I use high quality frozen strawberry if there aren’t any fresh ones around here? I love seeing your updates and hearing about the Pantry. you read my mind: ew! jello! 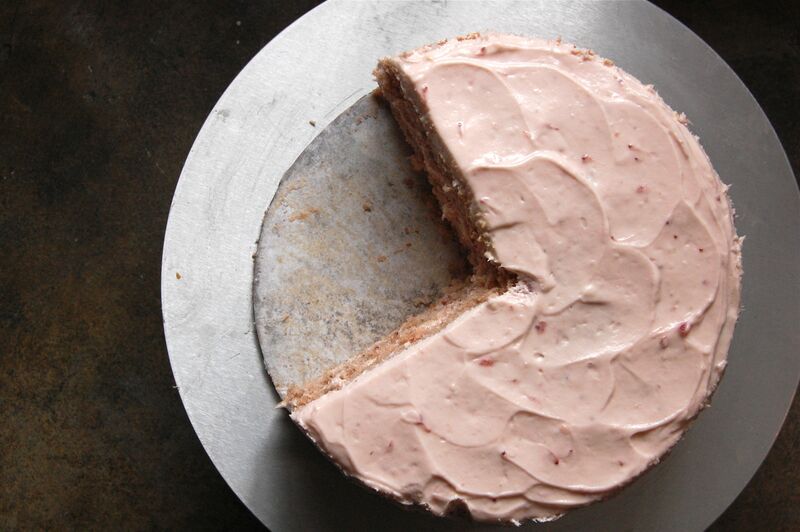 now here is what looks like the perfect strawberry cake. I wonder how oz or cups of strawberries it takes to make a cup of strawberry puree? This looks delicious! Right now strawberries are about a dollar a pound here in Northwest Argentina, and I can’t wait to try this!! So pretty and homey. And I really had a strawberry cake with cream cheese icing at my 8th birthday party when I was a little girl! How have I not had strawberry cake before? I fear I have missed my chance for this year. Ohhh except for the bag I stashed in my freezer – they have just found their destiny. Thanks! Thank you for the strawberry cake, made this weekend for the birthday of a (more like) well, let’s just say, over 50 year old southern girl. Looked beautiful, baked up perfectly, tasted great. Thank you! I love how the cake is the palest pink. A strawberry cake would be a great way for me to use up the leftover strawberries in my freezer; thanks for the great idea! I just made this cake – I used Swans Down Cake Flour – I did not see baking powder in recipe – my lares smell wonderful but they are very, very thin – did not rise at all – is this the way they should be – hopefully I will have answer before II frost them later – need to take to a tea tomorrow and wondering if I did something wrong. Thanks! Hi Cheryl. What a bummer, it sounds like your baking soda was old. They should be super fluffy. Sorry about that! I had the same problem. I followed the recipe exactly and my layers did not rise. I also used Swans cake flour. The cake did not have much of a strawberry taste either. Not sure what went wrong. Hi Denise! I don’t know what to say, I’ve made this cake a dozen times and it always rises. Maybe check that your baking soda is fresh? As for the strawberry taste, unless you live in Florida (with those crazy fruit seasons!) I would imagine it is hard to find sweet strawberries in February. If your strawberries had white centers, then they were likely the cause of the blandness. Look for ones that are blood red all the way through, they will have enough oomph to survive the baking process. Good luck! What can I say? I’m drooling right now….I want a bite!!!! I grew up in Birmingham, Alabama and had strawberry cake for nearly all of my birthdays! I’m thrilled to see this post because I’ve unsuccessfully tried to recreate that experience here in my new home on the west coast. This recipe sounds like a winner! If you are ever in the Birmingham area, you should definitely try Edgar’s strawberry cake. It’s to die for. MAN I missed out. Once strawberry season rolls around again I will be all over this. Or for the first 8 year old I find that lives and dies for pink. This cake is just so pretty, so feminine. I love it!!! Lady, you made my day! I’ve loved strawberry cake for years, but I never knew it by that name. My Midwestern family just called it “pink cake,” and it originated exclusively in a box cake mix. I remember asking for “pink cake” as my birthday cake on many occasions. Now that I know it originated from a *real* cake with REAL strawberries, I can’t wait to make one. Seriously I can actually SMELL the strawberries coming through the computer…and I am not kidding! I need to make a cake for my friends wedding next week and would love to use this recipe…it is November though and I cannot bring myself to use strawberries out of season…maybe I can figure out a good subtitute..either way I will make it at some point…THANK you! This is so dear! Makes me want to be a kid again! One of the best places to eat in New York serves up some delicious mini strawberry cakes with coconut flakes and this reminds me so much of that! I love this. Thank you! I love that it’s so pink……how much fun is that? I bet it tastes even better than it looks. I saw this on TasteSpotting a while ago, immediately bookmarked it, and finally got to make it yesterday when I found a pack of over-ripe, down-priced itty bitty strawberries at the supermarket. The cake was AMAZING– moist, not at all dense, and actually tasted of strawberries!! You have no idea how ecstatic and grateful I am about this beautiful cake! I’m literally waiting on tenterhooks for the next birthday/occasion I can make this for. But the frosting didn’t turn out so great. It tasted great and complimented the cake, but it was drippy, and didn’t turn out beautiful and creamy the way yours did. I did have to adjust the amounts because I only had 200g of cream cheese, but I used a calculator and was as accurate as possible about amounts/weights. I’d LOVE to (I WILL) make this cake again and again, so it would really help me out if you could help me figure out what I did wrong. Thanks again, this cake is absolutely DELICIOUS! Strawberry cake was my all-time favorite birthday cake growing up! Have never seen a recipe for this without jello, Thanks! This looks great. I wonder if it could be mixed with other fruits. It’s my younger daughter’s 5th birthday party on Sunday and she had requested a strawverry cake. Thank you! My cake of the year!! AMAZING CAKE. So refreshing and delicious. Thank you for sharing this recipe. I can’t wait to make it again. I am simply tired of coming across strawberry cakes…or any damn berry cakes…that are made with extracts, or worse, essences! And every other time, the cakes are just plain vanilla sponges layered with fancy strawberry speckled butter-cream. 😦 Unsatisfactory. Disappointing. And I feel just plain cheated! No wonder your cake sounds absolutely puh-fect! Thanks for sharing. I just made this cake in cupcake form, and WOW! You are one talented lady for creating this recipe. And the batter! Oh the batter. I could just eat it straight from the bowl by the spoonful. Ah yes, and I made these pink beauties for a guy. Oh boy! I want to try this with raspberries and strain out the seeds. YUM! Brandi, do you mind if I re-print this recipe with my raspberry changes and link back here? I’m making some Spring cupcakes tomorrow and I might try this recipe, it looks divine! Strawberrries were on sale Sunday, and I immediately thought, must find that strawberry cake recipe I stumbled across! So, a search through my browser’s history showed that I’d found the recipe about a month ago. (This was on Monday, and I just realized I have your blog bookmarked already, oops) I raced home from work, made a big mess of my kitchen, and ended up with 24 cupcakes that my coworkers RAVED about the next day. I didn’t even use cake flour, though maybe that’s why they seemed a little dense to me. For the frosting, I just used some of the leftover strawberry puree instead of jam, plus a bit more powdered sugar. I could not stop sneaking bits of frosting, and I think I’ll go grab a taste of the extra I put in the fridge. Never made a strawberry cake before, and this one was awesome. Making this for the second time, for a 1yr old girl’s birthday this weekend. Absolutely love this recipe, have added it to my repertoire. Baked up wonderfully…if you had a problem with rising it could be not beating enough air into your batter at each stage. Icing a bit goopy the first time, though easier to deal with after refrigeration. The goopiness did rather add to the lusciousness of the cake though! I have added a 1/3cup more 10X this time and a Tblsp more butter and have refrigerated it overnight to make spreading easier, II need the icing to be firmer for transportation. My daughter will love this for her birthday. She loves almost anything that is strawberry. Made this yesterday for my pink-loving friend’s birthday! Swapped yogurt for buttermilk and raspberries for strawberries– turned out great. And yummy. And pink. Nice to meet you the other day! I just came across your site today. I am not from the south, but I love strawberries and cake! This is in the running for Mother’s Day dinner. Looks fabulous. I decided to make my own birthday cake this year (is that pathetic?) and was super excited to find your recipe. 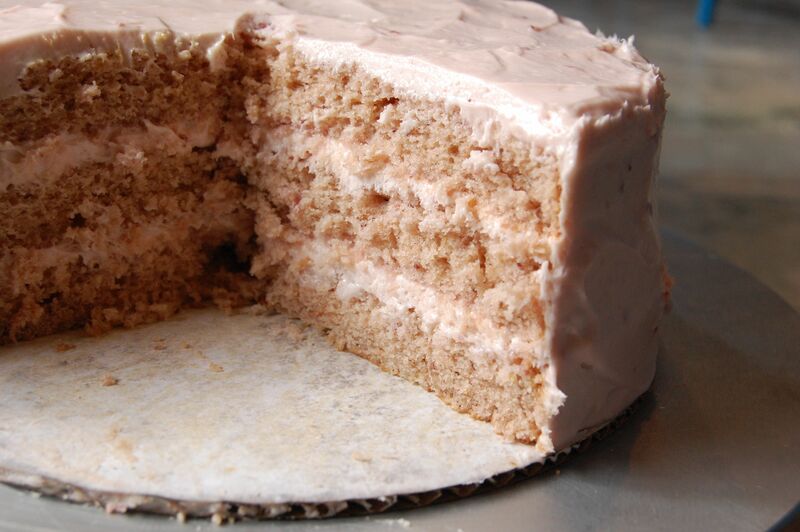 When I was a kid, I always requested a pink cake for my birthday, though that one was always from Betty Crocker. This cake was moist and delicious; I loved the lemony notes of it, too. It was so fun to bring back the pink cake tradition without dyes and artificial ingredients. Thank you! I just finished making your cake and it was a hit! !-so amazingly wonderful and moist!!! I will be making this again!! Wow! Best recipe for strawberry cake, EVER! Like you, I’ve been searching for the perfect recipe, and thanks to you, i finally have it. However, my cake didn’t really turn out the pretty pink I was hoping for…it was more of a purple? Anybody else have that problem? I’m thinking I might have used more vanilla beans than you called for which turned it a little darker. Regardless of the color, the cake is fabulous. Making it again this weekend. Thinking of using a drop or two of red food coloring to perk it up. I love this cake. It rose perfectly for me and tasted unbelievable. I just made this cake with ripe strawberries from my garden (It’s June in Seattle). This cake was very flavorful and it was more of a purple color. I will make it again when I have enough ripe strawberries. But next time I will frost it with a basic butter frosting, I found the cream cheese frosting a little too strong for the cake. wow! looks really yummy! can i substitute all purpose flour with cake flour? what will the measurements be? this just made my mouth water….great cake! has anyone made this cake and frozen it? Would love to make it for my daughter’s birthday but will be pushed for time the day before! I would like to bake this in a rectangular 9″ dark, nonstick pan. How would you change the baking time/temp? Thanks – can’t wait to make it! Just made this cake with apricot purée I had to use up. Just taken it out of the oven and I’m hopeful it will taste as delicious as the batter was. Granted it doesn’t have the fantastic colour but this is definitely a great recipe. Thanks. Thank you for this recipe. I had never heard of or made strawberry cake before, but found a need to taste one. After searching the web your recipe stood out as the one most made from scratch …….funny that..! It was very easy to make and is so moist, light and yummy. I adjusted only slightly because I did not have lemons and only had one round cake tin, for which I cut the cake in half. I put in only 1 cup sugar to the mix and it was more than sweet enough for our tastes. For us I would even lessen some sugar from the cream frosting next time. Since I did not have lemon juice, I put a bit of rose water in the frosting. Might not need it since it is already quite sweet and would have been nice to have that tang to offset. No matter I will be making it again with the lemons. Great recipe! This sounds really good. I can’t wait to try! My favorite strawberry cake is from Joe’s Italian in Alabaster, AL. It is the best cake I have eaten. I have been searching for a copycat recipe. Maybe this one will taste just as good. Though I am going to make a whipped cream cheese strawberry frosting like Joe’s does. Thanks for the recipe!
. Thank you! I cant wait to try this!!! I am late to this post and late to your blog, but wanted to express excitement over finding this recipe… Strawberry cake is one of my favorites, just ahead of cane syrup cake (I grew up in Georgia), and since my birthday is in May I try to make one every year. The recipe I’ve been using is based on one Angie Mosier, a pastry chef in Atlanta, gave to me, and it’s quite similar to this, but I think I’ll change it up this year and try yours, which sounds gorgeous. Also, just had dinner at Delancey last night and saw the maple mousse trifle (assuming it’s similar to the one you posted about here) on the menu… had eaten far too much salad and pizza or I would have ordered it! can you give me an estimated time if how long I should bake it for? Absolute perfection! Thank you for sharing your recipe. Thanks for the recipe! I made it with some modifications. I put chocolate icing layers from a German chocolate cake recipe I have, added food coloring to make the layers have an ombre effect, put strawberries on top and sprayed it gold with edible coloring for my golden birthday. Everyone loved it! The cake is perfect! Thanks again!! Also making it for my daughters baby shower. 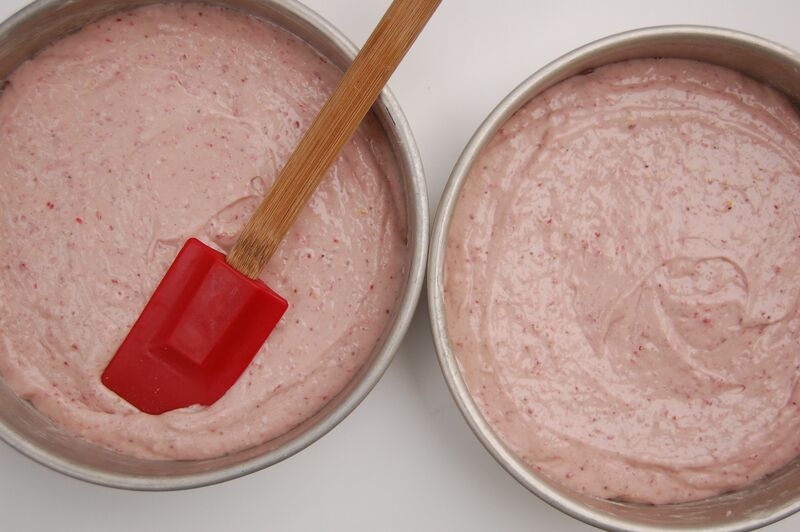 I am so happy to find a strawberry cake recipe without red dye (which gives my grandson horrible night terrors). Thank you! Can’t wait to make this. I made the cake for my daughter’s 18th birthday…she and my son loved it! I have cut gluten and sugar for a couple months- so I did not try the cake, but my daughter said that the flavor was even better the second day. I love the genius of adding the almond, vanilla bean, and lemon zest to the cake. The frosting was a little difficult to work with and was a bit runny. I will play with the frosting next time and probably do a strawberry buttercream. Also, i added some thinly sliced strawberries between the layers. I cant wait to make it again-especially when I find the perfect summer strawberries.